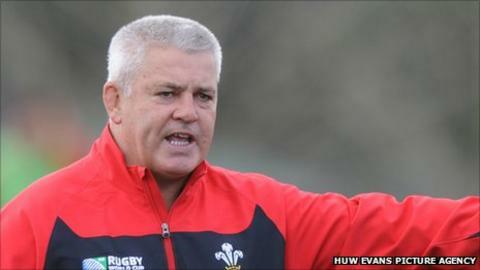 Coach Warren Gatland admitted he was not entirely happy with his side's record-breaking victory over Namibia. Wales went over for 12 tries in the match, but failed to secure the bonus point until after half-time. "We started off with 22 points and then the guys felt the game was all over, went to sleep and stopped being aggressive," said Gatland. "They got a bit of a rollicking at half-time and came out in the second half and did the job." Gatland was also dissatisfied with the Welsh scrum, but was pleased that all seven replacements who came on made a mark. "The disappointing thing of the night was the scrums were pretty messy, and there were a lot of penalties, but we'll have a look at the tape and sit down over the next couple of days and look at the side for Fiji," added Gatland. "The impact off the bench was really good and overall, with the number of changes we made for the game - 11 - I'm really pleased." Skipper Sam Warburton was more positive than his coach, hailing a job well done in taking Wales a step closer to a possible quarter-final meeting with Ireland. Wales' winning margin was greater than their previous tournament best of 72-18 against Japan four years ago. "We got the bonus point, which is what we wanted," said Warburton. "Namibia made it very tough for us, particularly in the contact area which was a bit of a disappointment from our point of view. "But credit to the boys, we got 12 tries and the all-important bonus point. "The game broke up in the second half and the boys showed their skills, and we got 12 tries which will be important to our points difference."